Dogs need exercise, but sometimes it is the owner who gets the greatest workout by trying to keep a dog under control that is attached to a standard collar and leash. That’s where a #dog harness vest comes in. Standard equipment will work for many dogs. However, there are some dogs that just do not respond well to the use of a regular leash. Some people use choke chains or pinch collars. Both of these devices can cause pain to the dog. People who have dogs that are pets, best friends and part of the family may want to consider the advantages of a combination harness and vest. Our family uses the vest for car trips and for our daily walks. It takes a little effort to learn how to put the vest on the dog, but once you master that, the rest is easy. How long have you been looking for the best dog harness vest? Long enough that you have had to take some back because they were too small or too large? Long enough to watch your precious pup hop right out of the allegedly hop-free containment? Long enough that you have given up hope of ever actually finding a model that truly qualifies as one of the best harness vests on the market for your particular dog? The fact that remains is when it comes to harnesses designed to keep your pup safe from harm during everything from long hikes to short bathroom walks in the backyard, the vest style really cannot be beat. Generally speaking, vest harnesses wrap fully around the torso of the animal and thus provide not just greater handling than a mere collar ’round the neck, but far more comfort than a collar. We have reviewed the three bestselling #dog vest harness that are for sale on Amazon.com to show you what each has to offer! The Ruffwear Swamp Cooler Cooling Vest for Dogs is the best dog harness vest for dogs who live in exceptionally warm climates or who have thick or dark-colored coats. It is also ideal for dog owners who enjoy taking their pets on long walks or hikes, when dogs are most susceptible to heat-related health problems like heat exhaustion. Check out the Ruffwear Swamp Cooler Cooling Vest right here! The Ruffwear Vest has been designed incredibly well, with a high level of attention to detail. Almost everything about it was created with the end goal of maximum cooling in mind. Its three layers work in tandem to create a highly effective heat management system for your dog. The outer layer reflects heat from the sun and assists in the dog’s natural heat distribution mechanism by facilitating evaporation, thereby getting rid of any excess water that may be weighing down your dog’s coat (this is the reason why the vests are only available in light colors). The middle layer stores cool water that chills your dog and helps it regulate its temperature. When the water ceases to be cold enough to cool your dog down, it rapidly evaporates, helped along in this by the aforementioned outer layer. The innermost layer, the one that is directly in contact with your dog’s coat, enables the cooling effect of the vest to move from the outer and middle layers to the dog itself, thereby completing the cycle and leaving your dog feeling cool and comfortable. In addition, the inner layer accomplishes all of this and still manages to keep your dog dry. This is ideal for dogs who hate being wet. The elastic securement band will not restrict your dog’s movement either. The Ruffwear Swamp Cooler Vest comes in seven sizes, ranging from extra-extra-small to extra-large. The sheer number of sizes available means that this dog harness vest will undoubtedly fit a wide range of dogs. There is a sizing chart available on almost every website on which the harness vest is sold, so you will be able to see more accurately the size of vest that would be best suited for your dog. Each dog harness vest fits a smaller range of girths within the range of dog sizes (for example, the medium Ruffwear Swamp Cooler Vest fits dogs with girths from twenty-seven inches around to thirty-two inches, measured at the widest part of the ribcage). Owners of the Ruffwear Swamp Cooler Vest seem to have little to no problems setting up the vest and suiting up their dogs. The instructions indicate that the dog harness can simply be drenched in cool water and wrung out, making the vest pretty idiot-proof. However, if a more profound cooling effect is desired, the vest can also be frozen, or soaked with ice water. Some may find it difficult to get larger vests evenly wet, as they are pretty unwieldy. The vest is machine-washable, but if you are worried about the possibility of your washing machine making the vest less effective, feel free to wash harness by hand. A downside to the light color of the vest is that it will get dirty quite easily. But, as mentioned before, this is fairly easily fixed either by hand or machine. A possible drawback that seen in the Ruffwear Swamp Cooler Vest is the cost. The harness vest costs around sixty dollar, which is on the pricier end of the dog harness spectrum. This could be a deal breaker for those on a tight budget. However, the cost may not be an issue to others in their quest for the best dog harness for their four-legged friend. Check out the Ruffwear Swamp Cooler Vest right here! The amount of time between the reapplication of water to the vest depends on a great deal of factors. Of course, higher temperatures mean more frequent vest wettings. Also, if your dog is more sensitive to heat, or has a particularly thick coat, it may be a good idea to add water as often as you feel necessary. But for the most part, the vest seems to remain effective for reasonable amounts of time. You may go hours without having to worrying about refreshing the vest. The Ruffwear Swamp Cooler Cooling Vest for Dogs is the best dog harness vest for dog owners who are worried about how their dogs will fare in high temperatures. This vest can finally put their minds at ease. One thing definitely worth keeping in mind if your search for the best dog harness has led you to consider a vest for the first time is that they are not the same thing as collars. You don’t just slap a harness on your pet and leave it alone. Since a harness vest should be engaged only when there is the need for your dog to be restrained by a leash, one of the most important factors to consider is the ease of getting into and out of the vest. Vest harnesses come in essentially two types: “over the head” and “walk in.” Ruffwear’s Front Range Harness is technically an over-the-head harness vest. With a little practice on your part and experience on the dog’s part, however, it won’t take much time before you can enjoy the ease of the walk-in experience. Check out the selection of Ruffwear Front Range Harnesses right here! Word of advice: make sure you order the correct size hardness for your dog and not one that is too loose. Fortunately, Ruffwear makes their Front Range Harness vest available in a variety of sizes suitable for girths ranging from 13 inches to 42 inches. While this range means that you can benefit from the solid construction of Ruffwear’s product whether you are trying to keep your terrier from digging up every lawn as you walk around the neighborhood or just struggling to keep a Rottweiler from scaring little kids, it is important to keep in mind that sizing recommendations is not an exact science and many dog owners on the fence have found it beneficial to go up a size to make sure the fit is both comfortable and effective. Okay, so this harness vest certainly hits the mark when it comes to the ease of getting your dog into it. But what about when your dog decides he no longer wants to be constricted inside a harness? Pet owners with experience using lackluster harness vest all share stories of watching their Rex or Lady suddenly turn into a Houdini as they magically work their limbs free of the attachment. The Front Range Harness from Ruffwear offers four points of adjustment as well as the additional security supplied by both a padded chest and belly panel. The result is a harness that allows for considerable leverage in the range of free movement during even the most robust of physical activity while substantially reducing the always-present potential of your dog successfully wiggling free. Part of the reason why some dogs are able to escape their harness vest is because they are prone to pulling away from the leash. That may be a dog problem or an owner issue more than something related to the construction of the actual harness, although you may come across models termed “no-pull” harnesses. Whether or not there really is such a thing as a no-pull harness is up for debate, but one thing is for sure when it comes to the Ruffwear model. And that is that dog that is bound and determined to pull is going to pull no matter what he’s wearing, but if he has been fitted with a Front Range Harness that is appropriate for his size, you shouldn’t have to worry about being led on a wild goose chase. Again, the most important thing is choosing the right size. Let Ruffwear handle the construction needs required to make sure the right fit keeps your dog in line. Those sincerely looking for the best dog harness vest will certainly not find the Ruffwear Front Range Harness perfect. But then you aren’t looking for a perfect harness since there is no such thing. Until such a product does come along, however, Ruffwear is definitely leading the way with a vest that meets all the necessary requirements for consideration as one of the best on the market. The Puppia Soft Dog Harness is an excellent example of the type of restraint that can provide safety to your dog and give the owner piece of mind in knowing that he has better control of his dog. It is made from 100 percent polyester, has an adjustable chest belt and a quick-release buckle as well as a padded neck opening. 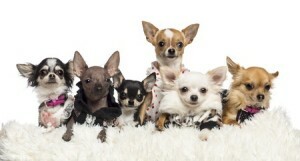 Since dogs come in various sizes from tiny to very large, it is necessary to get the right size. When purchasing make certain there is adequate time to test the vest and return it for a refund. The vests are harder to fit on extremely small dogs, but they can be used. However, they are very helpful for medium and large-size dogs. The versatility of the vest and its nylon mesh fabric offers comfort for the dog and greater security for both the animal and owner. With the leash attached to the vest around the dog’s body instead of being attached to the collar, the owner has increased control of the dog, and the dog will learn to tug and pull less. 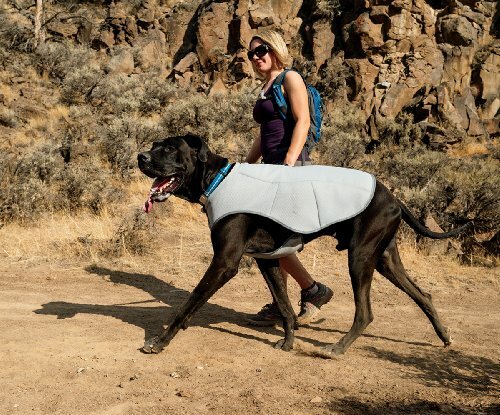 Furthermore, this vest will prevent accidental injury resulting from pulling a lease two hard or a collar breaking and the dog taking off for parts unknown. In researching whether or not the vest is your best choice you can find many comments on the internet and most give the vest a good rating. A few note that the neck opening and some other features did not match up well for their dogs. This could be the result of picking the wrong size vest, not fitting it to the dog properly, or the dog has some unusual physical characteristics. . 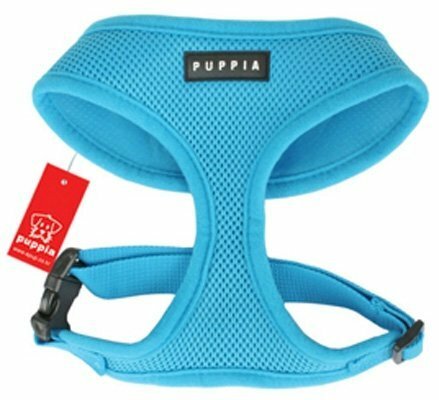 Check out the variety of Puppia Soft Dog Harnesses right here! The official product description claims that the product meets some of the demands or requests that have been received from customer. The description states, “This harness is the answer to the limitation of the Soft Harness. You’ve asked for adjust-ability around the neck, and this is the answer to your request. This harness features two quick-release buckles around the neck and loop and hook straps to provide needed adjust-ability for a proper fit around the neck. Adjusting the vest is easy. You just release the connection around the neck, open the straps and adjust both sides to fit around the dog’s neck. This is the perfect solution for dogs that fall between sizes. With a price under $17, the vest and harness do not represent a major investment, and could be very useful in controlling some strong-will dogs. Apparently, putting the harness on the dog the first time can be a little trying, but becomes easier with just a little practice. There are several adjustments that can be made around the neck. Some purchasers did indicate a wish for a bigger neck opening. The harness-vest comes in multiple sizes and colors. A matching lead can be purchased as well as a retractable lead. The Puppia Authentic RiteFit Harness with Adjustable Neck appears to be a good product that will benefit owner and dog. It may not be perfect for every dog, especially very small or tiny breeds and those with unusual builds. However, the cost of purchasing the harness is not a big risk. Therefore, if it does work for you and your dog, it is definitely a good investment. Even with the best dog harness vest, there is a period of adjustment that must take place for dog and master. Therefore test the harness vest on your dog in a controlled area to if the results you want to see are evident from the use of the vest.